Dubai has become the most attractive holiday destination amongst the Middle-Eastern cities and is one of the most important cities in the world. Dubai is one of the most populous cities in the United Arab Emirates and is famous for its luxurious surroundings and growth, with wonderful sights, glowing skyscrapers and sunny beaches are all features of Dubai. It is also considered as the fifth safest city in the world. It is one of the most popular weekend destinations which exceed Paris. 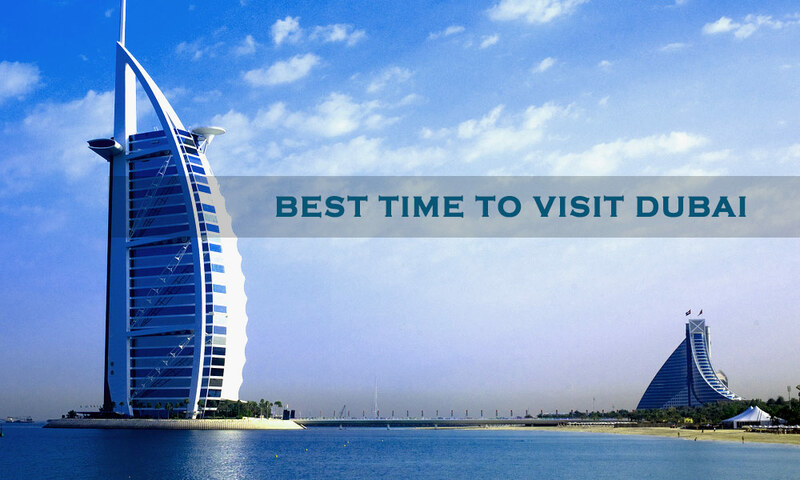 Thus, those traveling to Dubai, it is important to know the best time to visit Dubai to make the most of your trip. The vacation trip to Dubai points towards sand, beach, sun and shopping. Weather-wise, Dubai only experiences two seasons: hot and hotter. The best time to visit the scorching hot city of Dubai is from November to April, when cooler with blowing winds during the night time and the evenings and the hot sun is at rest. During the winter months, the city experiences prime beach weather and sees blue skies. This is the peak tourist season in Dubai. But even if you visit the city during the rest of the month, you will find malls, hotels and other complexes well-equipped to keep off the heat. Dubai’s weather remains humid and hot throughout the year with a daily average of high sun hours per day. It would obviously be nice to have some sun, but not in the height of the season when it is excruciating. In Dubai, November to April is the tourist season so expect plenty of crowds during those days. January and February see high tourist traffic, especially because of the Dubai Shopping Festival. However, if you visit during the summer months, you can escape the heavy crowd, but be ready to experience the hot boiling sun and the triple-digit temperatures and high humidity levels. The period between November to April also sees the majority of the city’s festivals. You can make your holiday remarkable where you can experience Dubai Camel Racing. It is held every Thursday and Friday between the months of October and April. Rugby Sevens is also hosted in Dubai during the month of December. The best shopping period in Dubai is during the month of January to March during which the famous Dubai Shopping Festival takes place of the period of four weeks. A visit to the attractive place Dubai can be avoided for a holiday especially during the month of Ramadan when the strict rules of Islam are valid against drinking, eating and smoking. As a consequence of Ramadan, the rates of many of the hotels drop down to 70% during the day times where you have to follow the rules. You are requested to eat somewhere indoors or close the windows of the restaurants and cafes if you want to eat during the day time. Avoid the period between June and September. You will not be able to enjoy many of the outdoor activities except for Dubai nightlife, though the air-conditioned buildings keep off the heat. Getting pleasure from camping, camel riding and desert safaris would be a bit difficult. Sun bathing and playing at the beach can be well-regarded during the months of April and October where the temperature raises up to 40ºC. During the months of November and April, the weather is very pleasant and well suited for all types of outdoor activities in Dubai. The winter season is the best time to visit Dubai & to spread out along the Persian Gulf’s pearly white sands. During the months of January- February you will see Dubai actually crowded. Around the globe, sun seekers prefer going to Dubai to take the advantage of the most desirable weather, so in order to ensure availability it is better to make hotel reservations months in advance. January to March is Dubai’s rainy season so beach bums should note that. During this season, the hotel rates and airfares go really high since this is the peak tourism season. It is the best time to visit Dubai, so it is also better to book in advance to get the best possible rates and to not face any inconvenience. During the months of November and April, the temperatures are in between 24-35ºC keeping the night’s cold and the evenings warm. The gentle wind is observed during the months of December, January and February. The temperature rises up till 30ºC by April that indicates the beginning of approaching the hot season of May. Dubai bids farewell to its tourists during the summer months. During this time of the year, rainfall is scarce, highs are in the 100s and the humidity levels often rest around 90 percent or more. Avoid spending too much time outside, to protect yourself from heat stroke, also drinks lots of water and wear plenty of sunscreen. Any outdoor activity is made unbearable with weather like this, especially a day at the beach. Prices are generally lower during the summer season as compared to the winter season and you won’t have to worry about finding a spare room in a hotel. During peak summer, the temperature starts hitting the forties and it actually starts rising in April and May. It is impossible to explore the outdoors during the summer months due to its extremely hot weather and humidity. However, you can indulge in as much retail therapy as you like as all stores and malls are air-conditioned. Now you know the best time to visit Dubai to make sure you book your travel dates accordingly. If you want to make a suggestion, please do so by adding comments below.